Japanese tea growers decorated a giant pig with “susuki” pampas grass in Shizuoka prefecture. 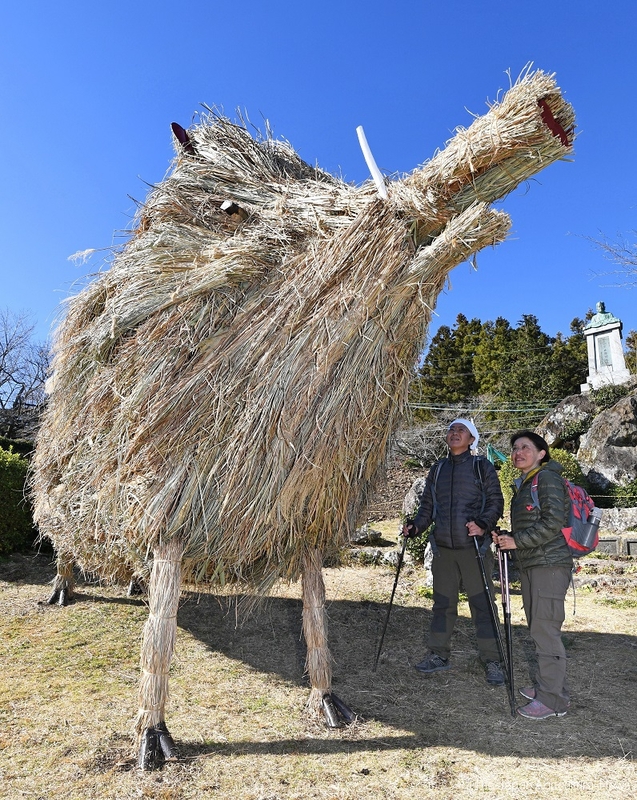 KAKEGAWA, Jan. 5 ― Japanese tea growers have welcomed the year of the pig in the Chinese zodiac calendar with a giant pig made of “susuki” pampas grass. A group of about 20 tea growers installed the 5-meter-long and 3.5-meter-high pig shaped object at the top of Mt. Awagatake in Kakegawa, Shizuoka prefecture. They used 500 kilograms of silver-colored susuki pampas grass, which is also known as “chagusa,” used for tea cultivation providing natural fertilizer in Shizuoka, a main producer of Japanese green tea.